Jaboukie Young-White is an NYC-based comedian and filmmaker. He and his popular Instagram and Twitter accounts have been featured on The Fader, Clickhole, and Buzzfeed. 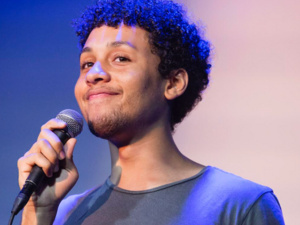 Jaboukie was a finalist at NYC Devil Cup Stand Up Festival, a featured comedian at the FOX Night of Comedy, and was named one of Rolling Stone’s 25 Under 25. He recently appeared in the Sony feature ROUGH NIGHT, directed by Lucia Aniello and will be seen in the upcoming Netflix feature SET IT UP, directed by Claire Scanlon. Jaboukie was recently staffed on the untitled comedian Franchesca Ramsey pilot for Comedy Central, on Season 1 of American Vandal for Netflix, and is currently a staff writer for Big Mouth, also on Netflix. He was selected as a “Comic to Watch” at New York Comedy Festival 2017 and will be one of Vulture/New York Magazine’s “Comedians You Should and Will Know” 2017. Jaboukie recently made his late night debut on the Tonight Show with viral reception and is featured frequently on the Daily Show with Trevor Noah.